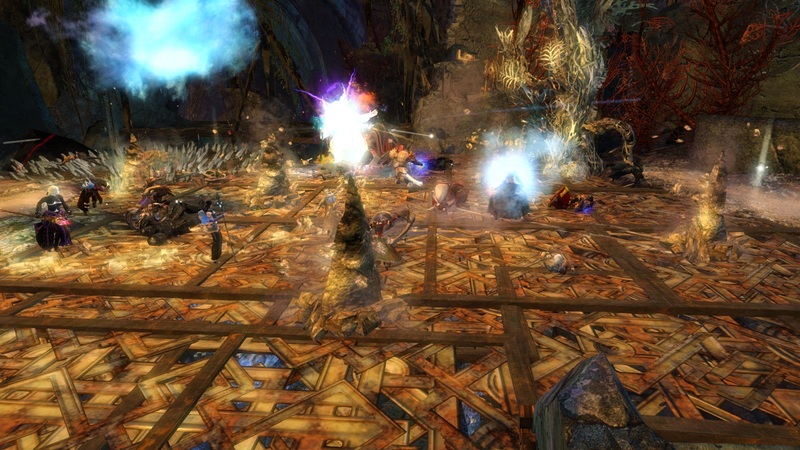 Massively has a nice article on a QA session with two ArenaNet designers at PAX East. Bhagpuss already gives a pretty good breakdown along with his thoughts. I don’t agree with everything Bhagpuss says, but I feel he is right on the mark in saying that ArenaNet develops for geological time. They expect their game to be lively in the years to come, and each advancement is built with that in mind. One issue I want to tease out of the Massively’s article is the issue of town clothes. The article states that the “cosmetic function of town clothing will be expanded”. However, ArenaNet feels that keeping town clothes to out-of-combat situations only is best for avoiding any immersion breaking. This answer seems too simple. It seems to miss so much of the forest for a single tree. It’s good that town clothes are going to be expanded. I think the simplest upgrade could be something like whenever a player enters a town they can toggle an option to automatically be in town clothes. I know that account-wide availability and town clothes storage are big requests. I have been scratching my head at all the functionality of Guild Wars 1 costumes that were simply lost when moving forward to the sequel. Guild Wars 1 is apparently immersion breaking because costumes were toggled to overlay actual armor in any situation. Of course one could protect their fragile immersion by never making sure to enter combat-ready instances only by themselves and their posse of computer-controlled heroes. Still if pick-up groups were chanced back in the heyday, one might find themselves grouped with a pumpkin-headed Dwaynite or a lich ready to be wed.
Guild Wars 2 has made sure to keep their town clothes shark well underwater in comparison to its ancestor with the craziest costume being the Mad King’s Hat. The most immersion breaking is by far the out-of-this-world Dragon Emblem Shirt. Apparently ArenaNet and many fans would simply be appalled to see themselves revived by a t-shirt wearing Sylvari. It would be more shocking to learn that the t-shirt likely had polyester (for the phong). The interesting thing is: I seem to only notice other characters in the cities and non-combat situations, like dungeon-grouping. In the countryside my mind breaks other characters down by race, profession, and weapon. I don’t notice their painstakingly applied dyes or their carefully farmed armor set. I see shapes. It gets even blander because when all the fancy effects that looked so great with one or two people start colliding on a boss encounter. I see red circles on the ground, my feet, and a big white target filled with hundreds of additive effects. Other players become blobs of activity or icons of reviving. I feel like ArenaNet is trying to protect something that really does not exist with keeping town clothes out of combat. The individuality of players bottoms out in the signal-to-noise ratio of combat situations anyway. The “chase” armor desired by the community seems to be the most unrealistic. I see tons of flames, spikes, and creepy masks. What I don’t see much of are the dungeon sets that seemed to have been created in a toned-down manner, such as the Crucible of Eternity armor or the Ascalon Catacombs armor. Perhaps it’s because they seem to just fade in to the rest of the sea of “realism”, where the average of armor appearances tend to be. On the other hand, weaponry artists seem to have zero limits. Dulfy makes sure, in her guides, to note which weaponry has particle effects. There is a chainsaw greatsword. Some legendary weapons shoot unicorns and have shards of the sky in their blades. I do notice other player’s weaponry even if at the same time their carefully-attuned armor is not sending any signal to my brain. These effects break through the noise in heavy combat situations where I occasionally see swirls of the night sky streak towards a white blob. For better or worse, ArenaNet has already added “immersion-breaking” apparel to the game. Keeping it out of combat situations where it is least likely to be noticed does not feel like they are protecting much. I feel that ArenaNet has a lot of room to improve the identity of players in combat anyway. They can work on the ridiculous additive nature of effects. They can better individualize armors from a rather uniform baseline. And, they can let me wear town clothes in combat. I’d be surprised if someone noticed a charr wearing a toque in a combat situation anyway. I don’t even bother with town clothes. Why would I spend $7 on a piece of a gear I never see? I am against wearing town cloth in combat, but I am for having a lot more choice in town cloth – and not the strange ones, but just access to the NPC ones. Maybe I have miss where I can have access to the normal town cloth, but until now, I have only see the one I have start the game with, and the silly ones in the Real Money shop. Thanks for the link love. As usual I probably come over sounding more negative than I really feel. I’m still having a great time but some of the decisions do leave me scratching my head and it makes me want to sound off about it now and again. Why an expansion has to be such a no-no is beyond me. I’d love to have a new box/digital download to look forward to, either around the anniversary of launch or just before Christmas. I’d be delighted to give them my money – apart from the original box cost and a present for Mrs Bhagpuss I have yet to spend a cent on GW2. The immersion argument, one that I’d normally have a lot of time for, just makes no sense at all here. Not only do the effects on some legendary weapons surpass just about anyone’s ability to suspend disbelief, not only are many of the weapon and armor models beyond parody (those shoulder-pads that look like working furnaces, anyone) but as far as I can tell you can place cauldrons, feasts and the like and run around in your party clothes pretty much anywhere you like so long as you don’t actually attack anything. Oh well, as I said I’m still thoroughly enjoying myself. I can live with the odd decisions as long as the core remains strong. I expect to be around GW2 for the long haul so if they want to take their time it’s okay by me. Just one thing you might have missed, seeing as there is no mention, but you can bind a button to toggle the wearing of town clothes, it’s not bound by default. I like that there is a distinction between town clothes and combat armour. Town clothes is what you wear when you remove your armour and are relaxing around town i.e. the default cultural clothes, not so much the Mad King costume. Would love to have much more of it though, the hoodies were a small start. In terms of combat armour, I notice whenever someone has put some effort into getting a nice ensemble with an attractive dye scheme. And have sartorial blinkers for anyone who is wearing the complete CoF set dyed lurid colours. Guild Wars costumes: Great! Can be infinitely regenerated (so storage is never a problem, unless I dye a piece, of course), can wear any time outside of PvP (and, naturally, situations where the mission puts a costume on you) and on as many of my characters at the same time as I want. Guild Wars 2 town clothes: Garbage, to put it mildly. You get *one* of each piece, if you lose it, for whatever reason, you have to buy it for real money again (assuming it’s still available), it’s awkward to switch between town & armor (even if you bind to a key), and the situations where you can wear them instead of your armor skin are so limited that almost no one can ever be bothered. Oh, and they’re more expensive than GW1’s costumes.